Any food that comes off a stick is usually good, especially meat. These stick antipasto appetizers are a great idea for a get together or even as a dinner. They fill you up and don’t require any utensils. Even better, you can make them before hand and pull them right out of the fridge before company comes over. This appetizer is very diverse. 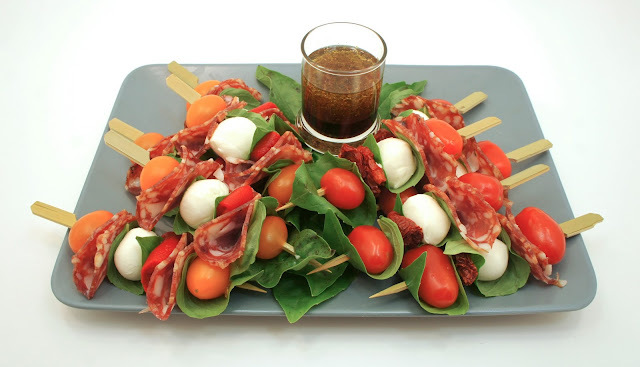 I used ingredients that I prefer, but add any veggies, meat or cheese you prefer, as long as they stick onto the skewers. Some items to be used include prosciutto, cooked cheese ravioli, artichokes, olives, etc. Gather all your ingredients. 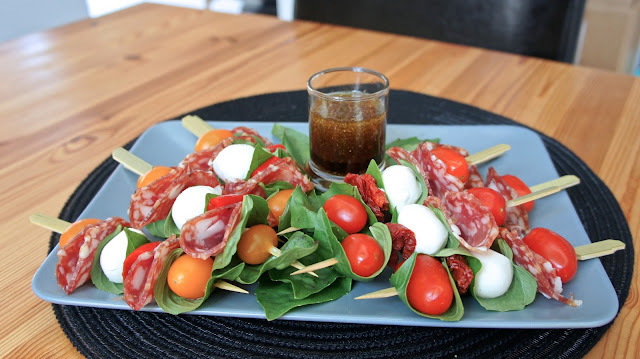 Stick the meat, cheese, veggies, and basil on each skewer in a consistent pattern. Don’t forget to make some vegetarian kabobs if you have non-meat eaters in your group. To make them look fancy, wrap the basil around the cheese or the tomatoes. Drizzle the tops of each lightly with olive oil and some balsamic vinegar. You could even use a pre-made vinaigrette. They can be made in advance, just cover tightly when storing in the fridge.